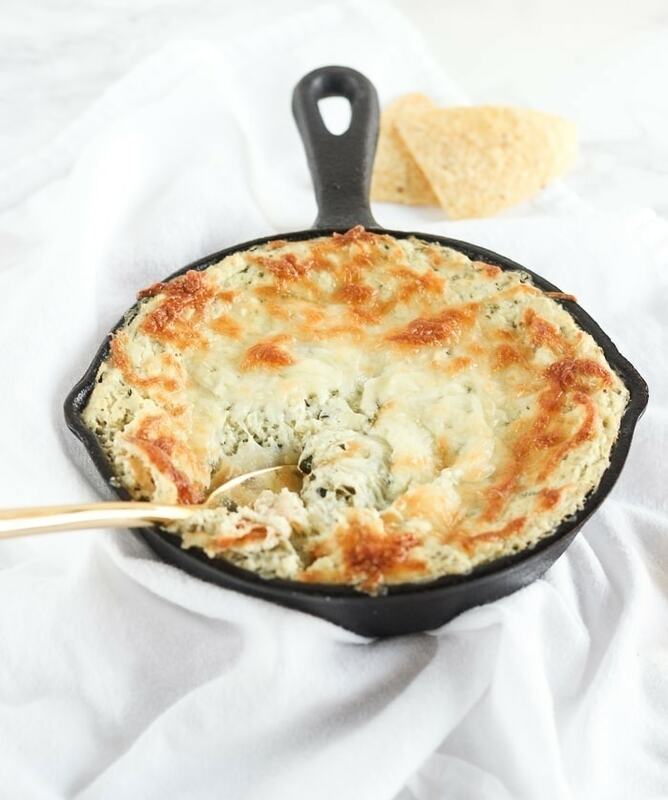 Lightened Up Kale Artichoke Dip is a delicious hot and cheesy dip filled with kale and artichokes, served with crispy wonton chips. It’s great for game-day snacking or a holiday appetizer! Hello, weekend! I’m glad you’re here. 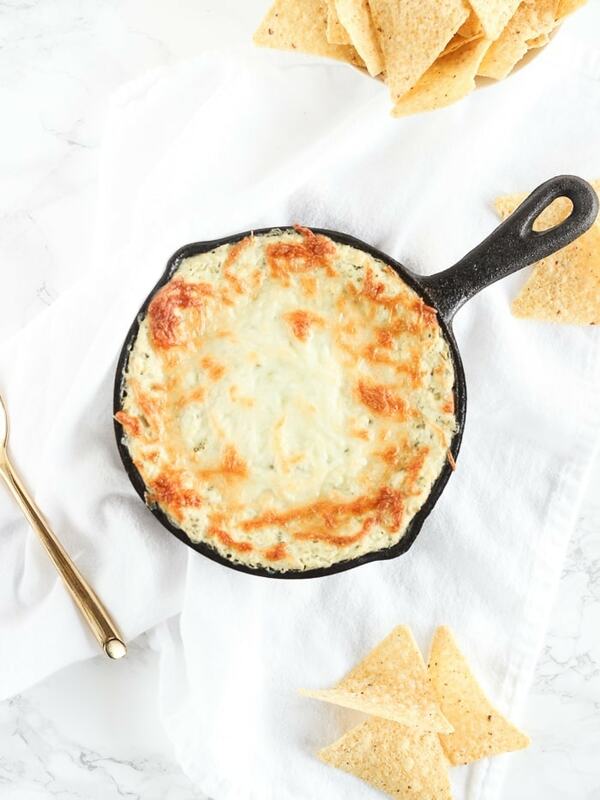 I’ve needed an excuse to make this heavenly Lightened Up Kale Artichoke Dip, and you are it. 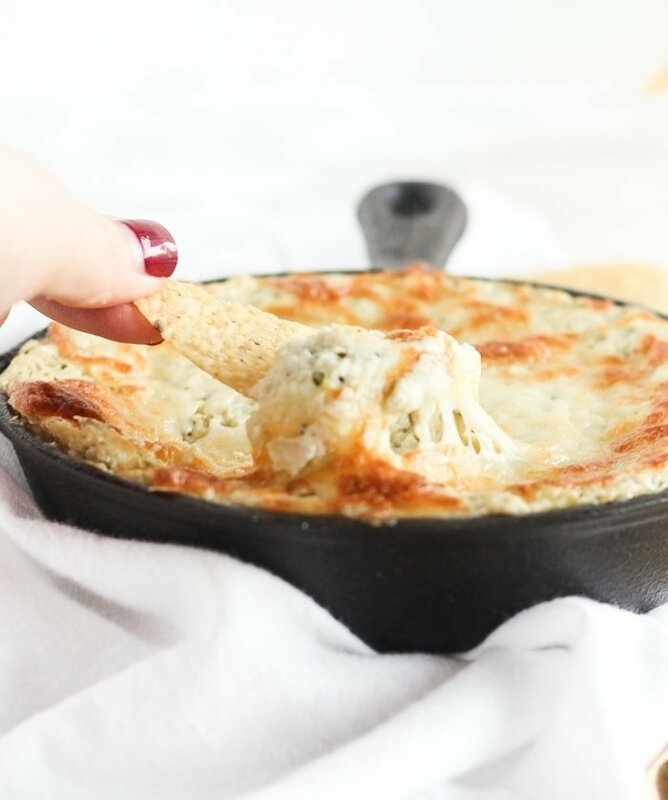 Can we all agree that spinach artichoke dip is one of the most loved dips of all time (besides guacamole, of course)?! I love hot, cheesy artichoke dip. It’s great for serving as a delicious appetizer for holiday parties or taking to football tailgates. But the traditional appetizer has a couple of flaws that I’d like to address. 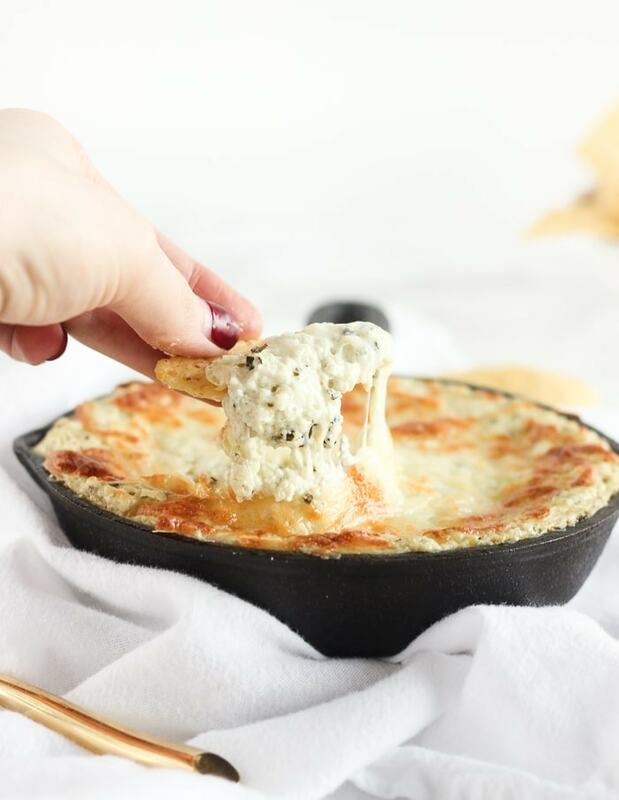 For one thing, regular spinach artichoke dip is usually with butter, mayonnaise, cream cheese, sour cream, or a combination or all of the listed ingredients. Then there’s even more cheese mixed in and melted on top. It’s delicious, yes, but it’s easy to over-do it when there’s a big bowl of the goods and a pile of chips in front of you. Especially if you’re zoned out watching football or have had a couple of glasses of bubbly and are chatting away. What’s worse is that it’s posing as a healthy dip since it’s got spinach. Good try, but no. Second, you normally have to cook your spinach (and if you’ve ever seen the Pioneer Woman make it, you have to cook your butter and cream cheese, too) before you bake it. I’m not about that extra step, so I replaced the spinach with kale. Unlike spinach, kale doesn’t release a bunch of liquid when it cooks. You can mix everything up right in the food processor, including raw kale, and put it right into the baking dish! To lighten up this Kale Artichoke Dip without sacrificing flavor, I upped the veggies for more bulk and used plain Greek yogurt and low fat cream cheese instead of mayo or sour cream. I also used just a fraction of the parmesan. It’s a pretty flavorful cheese, so if you go with a good quality one, you only need a little. 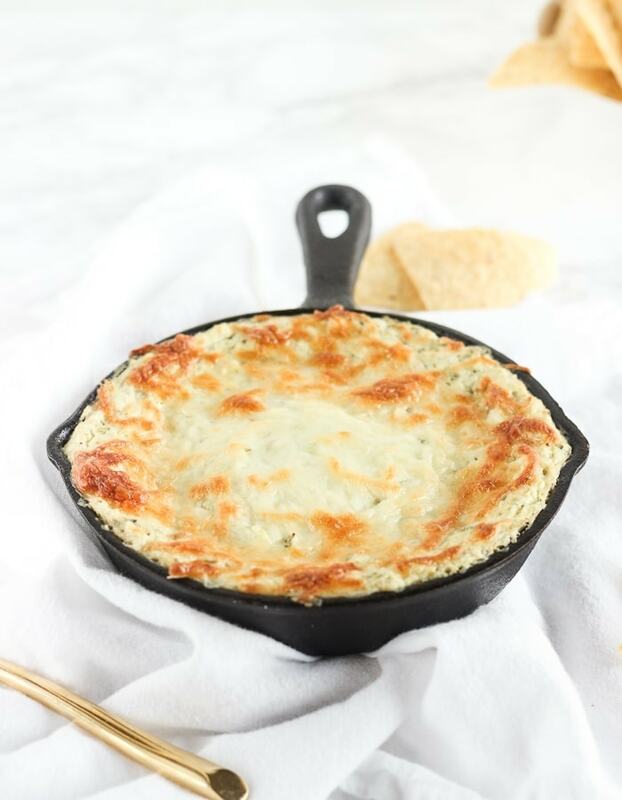 Lastly, I made the wonton chips in the oven while the dip was baking, so that you have a little healthier chip to dip in this glorious Lightened Up Kale Artichoke Dip. (They’re no pictured here because I got home from the store and could not find the wonton wrappers I bought anywhere. Does that ever happen to you? I felt like a crazy person, but I was not about to go back to the store.) I suggest serving it with cut-up veggies, too, for an even healthier vehicle to move dip to your mouth, but that’s up to you. I mean, you could even eat the cheesy, bubbly goodness straight from the pan with a spoon, although, you know, moderation. Also you might burn the roof or your mouth. Don’t say I didn’t warn you! In the bowl of a food processor, blend onion, garlic, kale and artichoke hearts until finely chopped. Add cream cheese, yogurt, and half of the parmesan. Blend to combine. Spread mixture into an 8×8″ baking dish. Top with remaining 1/4 cup parmesan and mozzarella. Bake for 15-20 minutes or until bubbly and top is lightly browned. Serve hot with wonton chips. Stack wonton wrappers and cut in half on the diagonal to make triangles. Spread wrappers on a baking sheet in a single layer and spray with olive oil. Bake in the same oven as the dip for 5-8 minutes flipping chips halfway through. Salt if desired. Oh my! This looks incredible. I think I would eat way too much of this but that won’t stop me from making it. Ooooooo this looks amazing. And I love the baking dish! Love how you lightened up this classically heavy dip. I will definitely be serving this during the holidays, I am sure it will be a hit!